Those of us who have been watching our local pair of Bald Eagles and their progeny for the past three breeding seasons are well aware that our Florida eagles are “contrarians” when it comes to migration. While nearly all other migratory birds head south after nesting and rearing their young, our local eagles do just the opposite– they turn north. Well, this is not exactly the case, as Florida’s adult Bald Eagles, especially those from the southernmost end of the peninsula, don’t exhibit as much wanderlust during the non-breeding season. Generally, the adults tend to move about locally, or at most, regionally in the lower third of the Sunshine State, while younger (1-4 year old) birds often become long-distance travelers. Our local pair in Pembroke Pines is now fixing up the nest they have used for at least three previous seasons. In this photo from last December, repair of the nest is about complete. On December 18th the first of three eggs would be laid. They appear to be following the same schedule this year, although now, vegetation has grown up in front of the nest making it almost impossible to see or photograph.. Thanks to satellite radio tracking, we know that younger Bald Eagles from Florida counter the prevailing trend by turning north in late June and July. Those that follow the Atlantic coast commonly end up at or near Chesapeake Bay, to be joined later by others of their species from more northern climes. 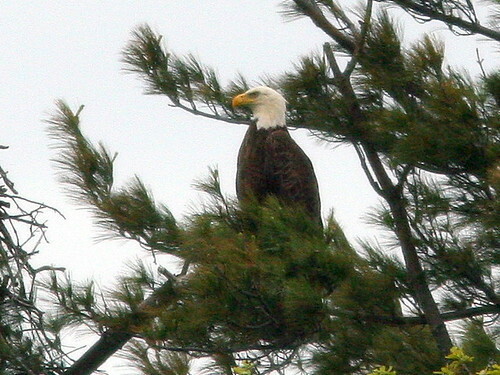 Some young eagles may fly as far north as New England and Canada. The above map, displayed on seaturtle.org, is from the Satellite Tracking Project of The Center for Conservation Biology, “Bald and Golden Eagles of the Chesapeake Bay,” It tracks the movements of “Cirtus,” a male eagle from Florida that was fitted with a transmitter in October, 2008 in the Chesapeake Bay area of Maryland. Click on the image to see a dramatic fully animated map that shows the entire record of Citrus’s travels. He has twice spent late summer and fall up near the border between Maine and Canada, and now, once again, has settled down on Florida’s Gulf Coast. This past spring, up at our Illinois “summer” home, a pair of Bald Eagles set up housekeeping only a mile and a half from our condo. 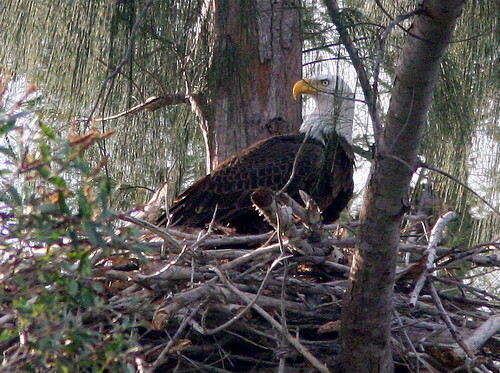 They were the first pair known to nest in Kane County since DDT was banned in the early 1979s, an interesting parallel to our Florida eagles, which gained notoriety by establishing the first active nest in Broward County. 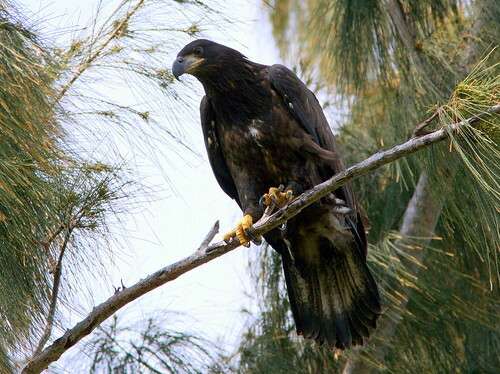 The Illinois eagles began breeding about four months later than their Florida counterparts.They probably laid their eggs in mid-March, after the oldest of the three Florida eaglets had already fledged. Mary Lou and I, as “migrants” between Florida and Illinois, assumed we understood the rationale for the deviant behavior of the Florida eagles. Our Pembroke Pines eaglets hatched out in late December and January, just about the nicest time for them (and us) to enjoy life in South Florida. By then, hurricanes are but a memory, rainstorms are few, and bugs are less troublesome. Fish and long-legged wading birds, both important prey species for eagles, are concentrated in smaller pools of receding water. 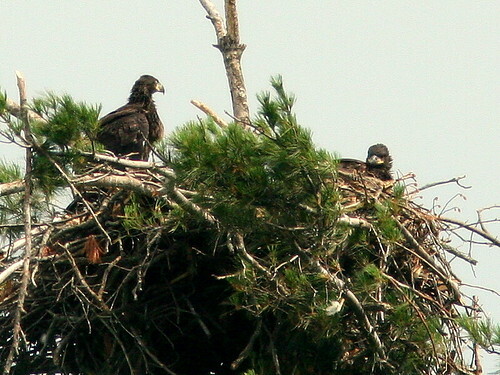 Parent eagles have no trouble finding food for their hungry and fast-growing broods. Who can blame the youngsters for getting out of the heat and incessant blackbird and mockingbird attacks, and for staying away until October or November, when the nights turn cool and the storms abate? 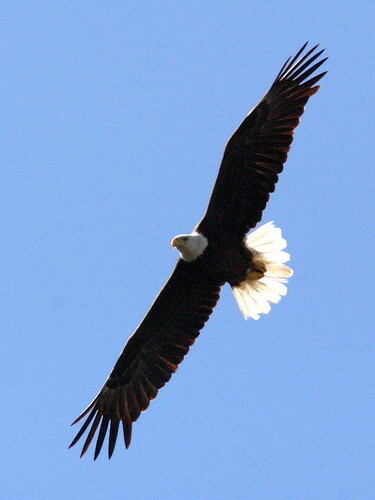 Likewise, since the diet of Bald Eagles consists primarily of fish, we assumed that the northern-breeding birds must move south to find open water as the lakes freeze up. As it turns out, our understanding of eagle behavior was rather simplistic. Like so many biologic phenomena, the explanation for the young eagles’ “reverse migration” is no simple matter. First, why do the adults stick around while the youngsters take off for distant parts? Can it be that there are other hidden “migrations” that contribute to this deviant behavior? Adult eagles appear to be motivated to remain near their nesting and feeding territories all year long, to defend them against rivals. Interestingly, young eagles follow two general routes northward, either the Atlantic coastal plain, or the Appalachian mountain chain. Those who choose the latter tend to travel farther north, probably because they benefit from mountain-associated updrafts. November 23rd, 2010 at 4:27 pm Wonderful shots! You would be welcome to contribute and help to begin a new endeavour called “World Bird Wednesday” a chance for bird photographers to share and spread word of their blogs to others! Visit http://pineriverreview.blogspot.com/ and check it out! Springman! November 24th, 2010 at 7:30 pm Just once I would like to see one of these magnificent birds in the sky! Very Beautiful and informative blog!